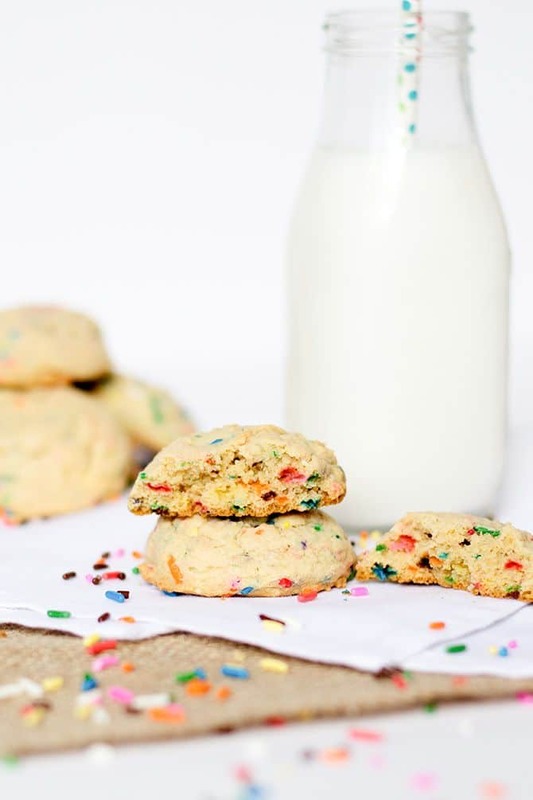 Soft and chewy cookies made with cheesecake pudding mix and added rainbow sprinkles for a sweet treat everyone will love! I remember when I was a kid, there was almost always a fresh batch of cookies coming out of the oven at my house. My mom loved having all the neighborhood kids over to our house and making fresh treats for all of us to enjoy. Now that I have kids of my own, my mom has continued that tradition and still loves having all the neighborhood kids over and makes cookies with them all the time. The funny part is, we live almost 1,200 miles away from my mom now yet she still has all the little kids over to her house. There are about 6 kids all about the age of my oldest daughter that live in my mom’s neighborhood and were friends with my daughter up until the time we moved away. Now that we are here, my mom has them over every few days and they bakes cookies, play games, and Skype with my daughter. I think it’s nice that my mom is still trying to keep the friendships of my daughter alive while we are so far away. Even when my mom comes to visit us, she still has to whip up a batch of cookies. Then she takes baggies and puts about 3-4 cookies in each baggie and gives them to my daughter to deliver to all the kids she is playing with that day. So, in an effort to be like my mom.. I have started baking cookies whenever my daughter requests them and we give them out to all the neighborhood kids. 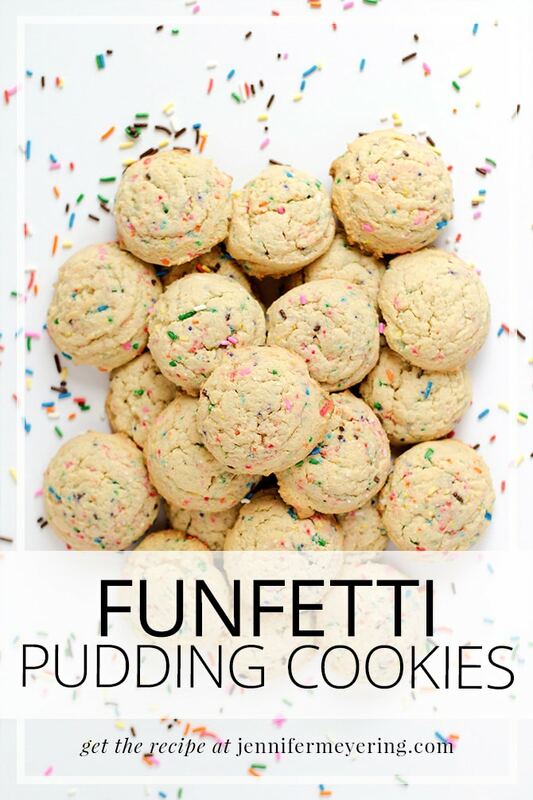 I love cookies so this is a no-brainer for me and now I’ve decided to do some experimenting with different cookie flavors instead of the traditional chocolate chip. Of course chocolate chip will always be #1 in my book, but you can’t go wrong with some pudding cookies. I love soft and chewy cookies and these are some of the softest and chewiest cookies I have ever made. And the sprinkles in place of chocolate chips make them a little more fun and colorful. Preheat oven to 350° F. Prepare baking sheet by lining with parchment paper or spraying with non-stick cooking spray; set aside. In a stand mixer with the paddle attachment, cream together butter and both sugars. Add eggs and both extracts and mix until incorporated. Add cheesecake pudding mix, flour, baking soda, and salt and mix until just combined. Add sprinkles and finish mixing until incorporated. Using a cookie scoop, scoop cookie dough out onto prepared baking sheets. Bake at 350° F for 10-12 minutes or until slightly golden. Let cool on baking sheet for about 3-5 minutes before transferring to cooling rack to cool completely. Your mom sounds so sweet! I can’t think of a better tradition to pass along to your own daughter one day than to make something sweet for her and her friends to share – especially when you make cookies that looks are fab as these! 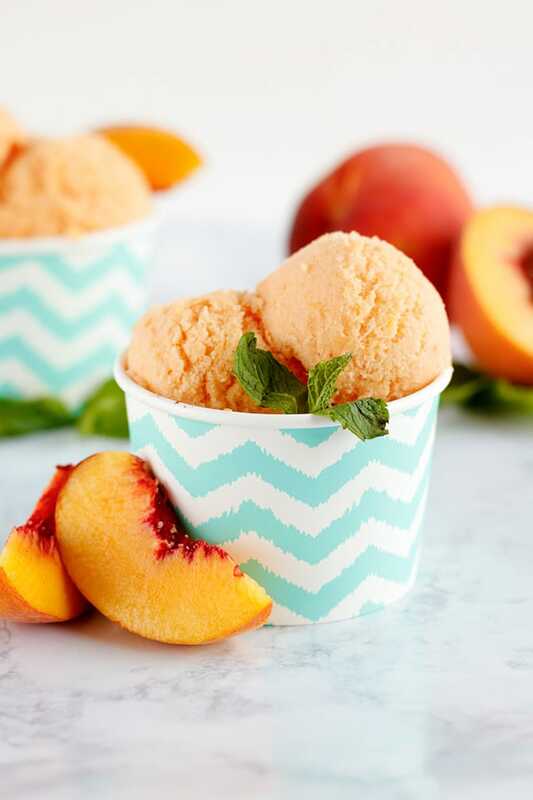 Perfect for any day! Yummilicious! Your photos tell the truth of your super soft, delicious cookies. I want to eat my screen!! Thanks so much for linking up to Merry Monday! Thank you, Megan! Look forward to the next one! OMG these look amazing! I can’t believe there’s actual “good stuff” in there.